What do you do when you find out a dam is going to be built on your home river? Do you start a petition, get other paddlers involved, write letters to politicians? 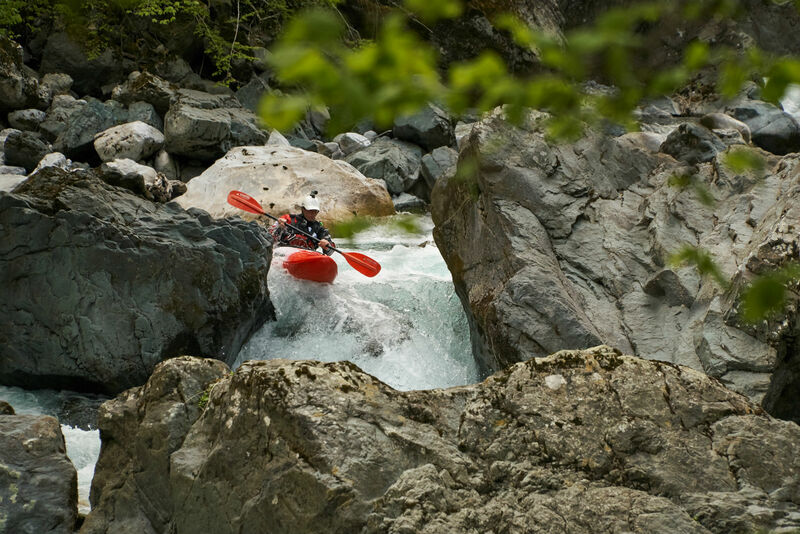 When Slovenian kayaker Rok Rozman found out there were 2,700 proposed dams to be built in his backyard, the Balkan Peninsula, he did the opposite—he went kayaking. And this seemingly simple action has started what has become the biggest river conservation movement in Europe. At its roots, the Balkan Rivers Tour (BRT) is about saving rivers threatened by damming. But the success of this movement comes from something so organic, and so simple: having fun. BRT created an atmosphere where people were united in the fight for these rivers. Around the fire at the end the day, a biologist can mingle with a local villager, a fly fisherman with a whitewater kayaker, each person sharing their concern and connection to the river. The second BRT began in Slovenia with the Soca Source-to-Sea paddle: 138 kilometers through the ‘Emerald River,’ which included portaging around five large dams that interrupt the could be free-flowing river. 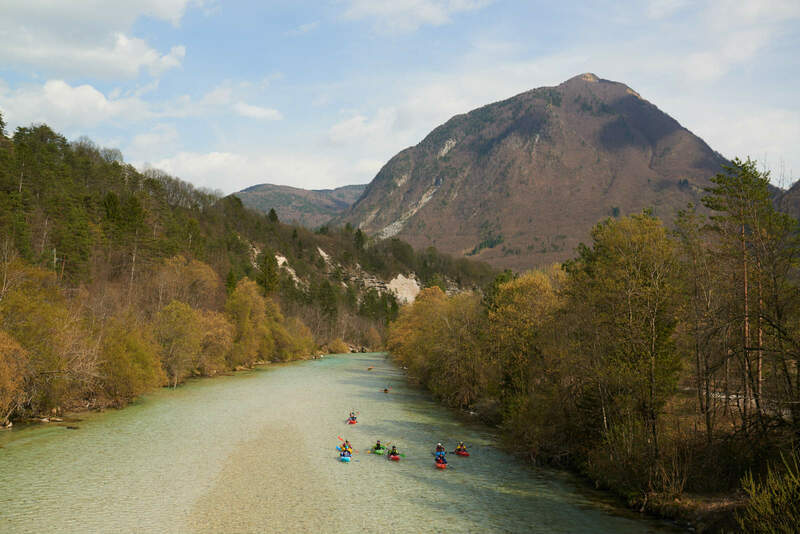 Paddling along the Soča River in Slovenia, kayakers from all over the world gathered to show their support of a free flowing Soča River and the opposition of dams there. Known as the Emerald River, the Soča is a kayakers paradise. In the summer, over 100 different rafting companies from all over the world use the river for commercial trips. After rappelling boats and people around the first of seven dams on the Soča River, kayakers participating in the Balkan Rivers Tour Soča Source-to-Sea Action could literally feel the difference in the water after the massive Podselo dam. Many of the dams encountered on the Soča operate below their intended capacity and have greatly altered the ecology of the ‘Emerald River’. 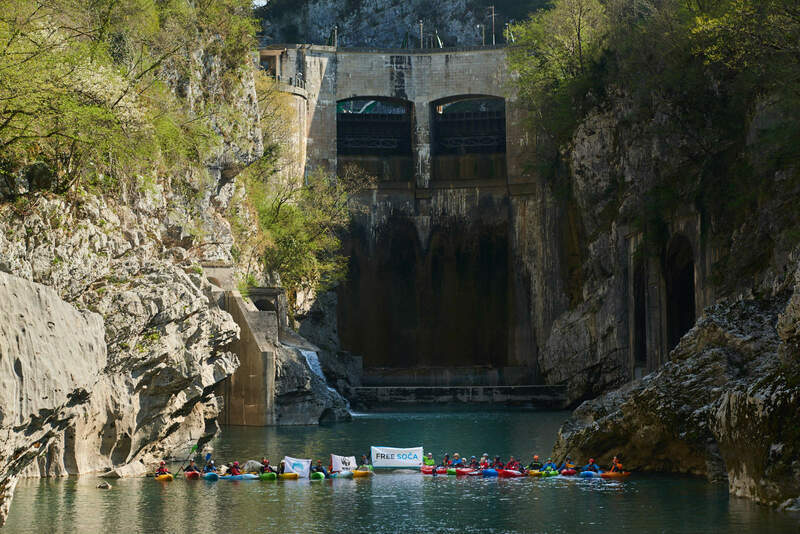 Shouldering boats, the kayakers of the Balkan Rivers Tour portage the Ajba dam in Slovenia on day three of the Soča Source-to-Sea Action. Being forced out of the water and onto the pavement, the mood became more somber with each dam encountered along the river that runs from the mountains of Slovenia through Italy, draining in the Adriatic Sea. The fresh water became salty as the Balkan Rivers Tour paddled the Soča River as it becomes one with the Adriatic Sea. Cheers, toasts and celebrations could be heard across the water as the group relished in the completion of the Soča Source-to-Sea Action in protest of hydro development. 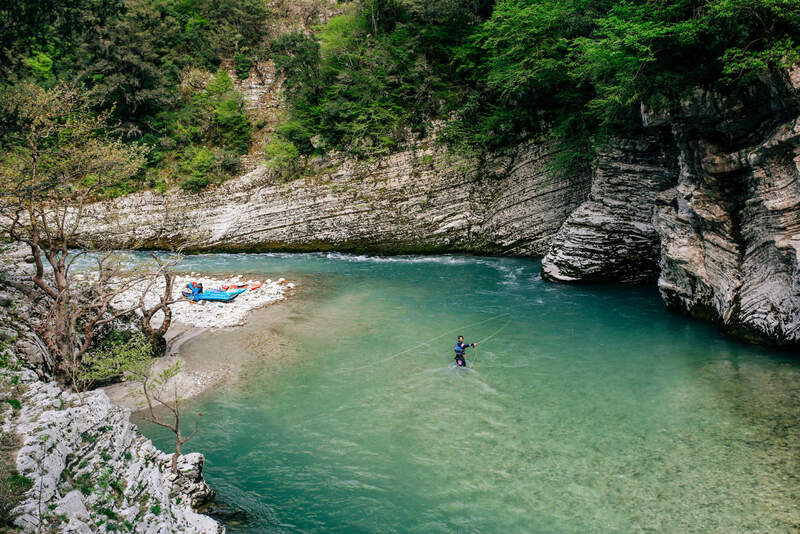 After paddling the emerald waters of the Soča River in Slovenia and Italy, a four-person group of the Balkan Rivers Tour team boarded a ferry for Greece and upon arrival, headed straight for the mountains. 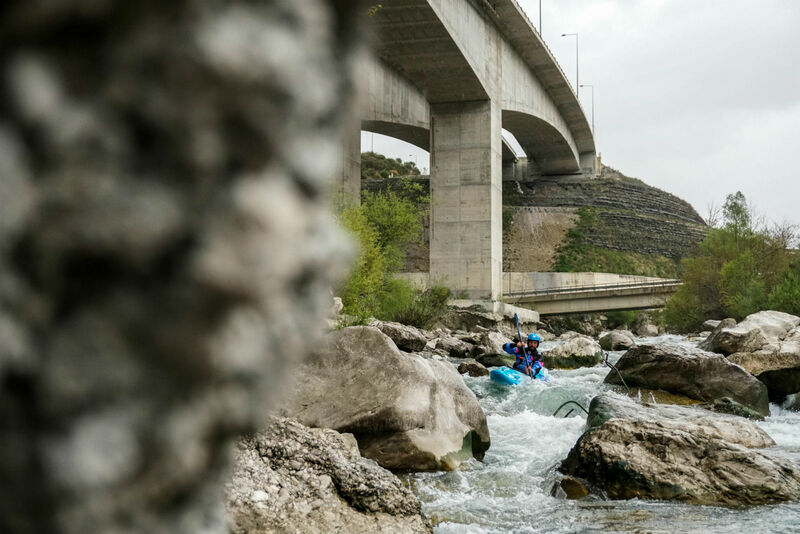 Paddling pristine canyons was contrasted by touring dam construction sites and power plants, scenes that can be seen on any one of the hundreds of rivers in the Balkans that are under threat of being dammed, diverted and destroyed. It’s no wonder the ancient Greeks believed that Gods resided in these valleys. Accessing the colorful canyons of the Kalaritikos and Arachthos by kayak allows for endless and remote fly-fishing locations. The difference between the jaw-dropping beauty and clear waters of the Arachthos, Kalaritikos, Voidomatis and Aoos Rivers of Greece was felt deeply as the team paddled, filmed and photographed the garbage-strewn and rebar-littered Metsovitikos River, where construction is underway to divert the river through pipes in the mountains, eliminating the already meager but stunning flow found there. 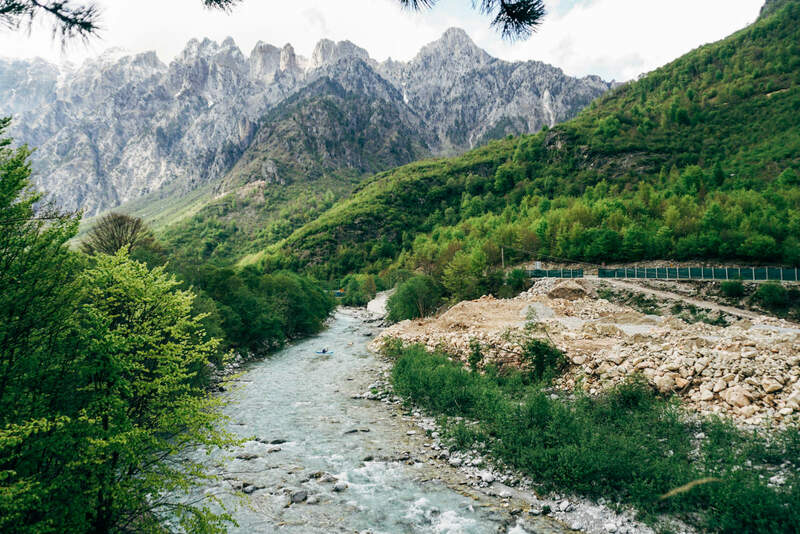 Hearing the blast of dynamite and seeing the riverside destruction on the Valbona, the urgency and injustice of a private company demolishing a river in a National Park is something that can not only be seen but also felt. Paddling under sprinkling cascades while watching birds of prey soar through the hundred-foot walls of the Morača River, jaws dropped and paddle strokes slowed. 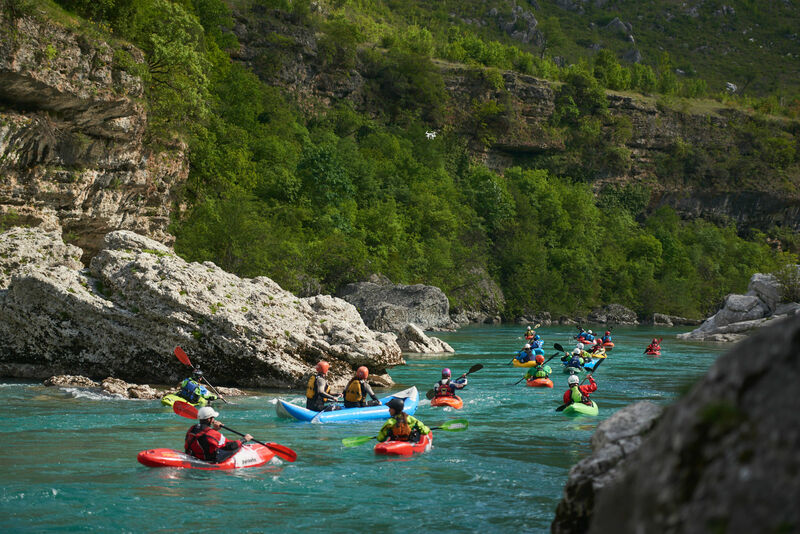 As the Balkan Rivers team descended the Morača River in Montenegro, the potential for rafting, SUP, fly fishing and incredible class II-V kayaking was experienced by each paddler. 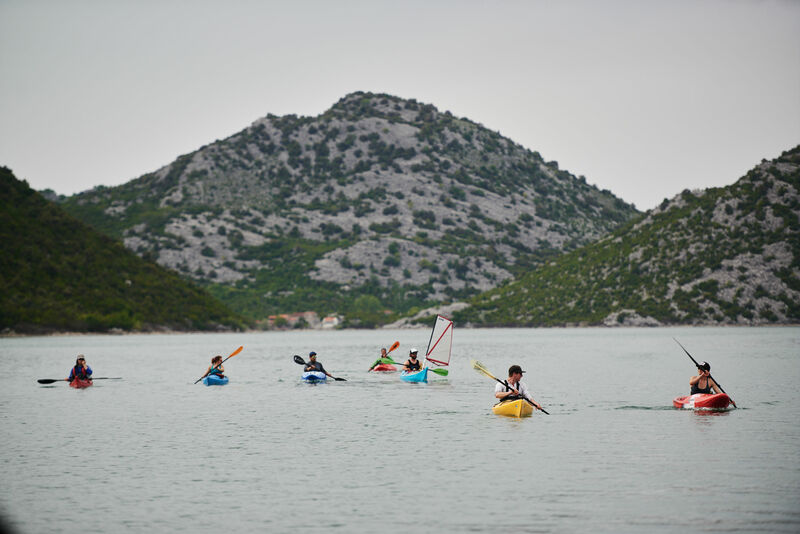 The Morača Source-to-Sea Action marked the end of the Balkan Rivers Tour 2 and saw the team follow the unobstructed and un-dammed flow of water, from the high alpine on the Moraća, to Lake Skadar and into the Bojana River where the BRT team paddled into the Adriatic Sea. Zan Kuncic bounces amongst the boulders of the Upper Morača as the Balkan Rivers Tour starts the source-to-sea descent of the Morača in the high alpine of Montenegro. The deep canyons of the middle Morača are a paradise for kayaks, rafts and even SUPs. Imagine a 100-foot concrete wall here? The Morača is in danger of almost 20 small hydro dams. Losing this river would be a tragedy. Balkan Rivers Tour is working with local organizations and tourism outlets to keep the beauty flowing. 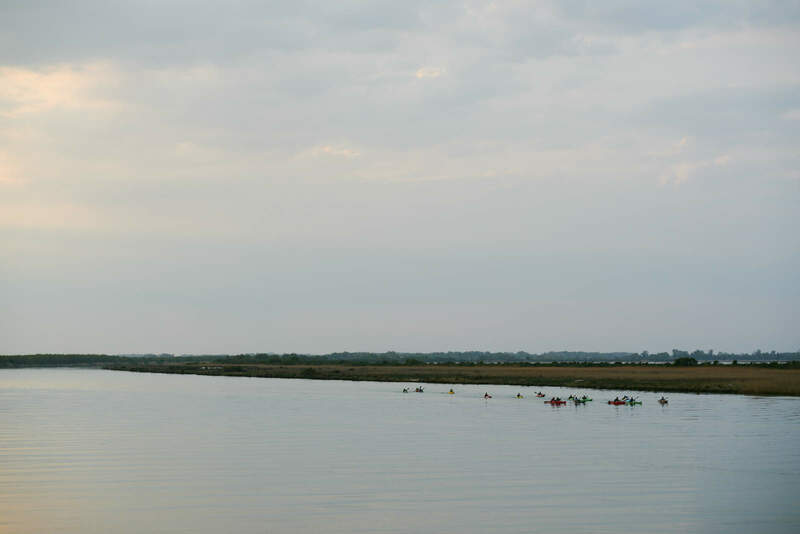 Switching from creek boats to sea kayaks, the Balkan Rivers Team used the wind instead of the flow to paddle from the Morača along Lake Skadar and into the Bojana River, eventually reaching the Adriatic Sea 200 kilometers later. All in the name of free flowing rivers.